While lines of latitude run across a map east-west, the point of latitude makes the n0rth-south position of a point on earth. 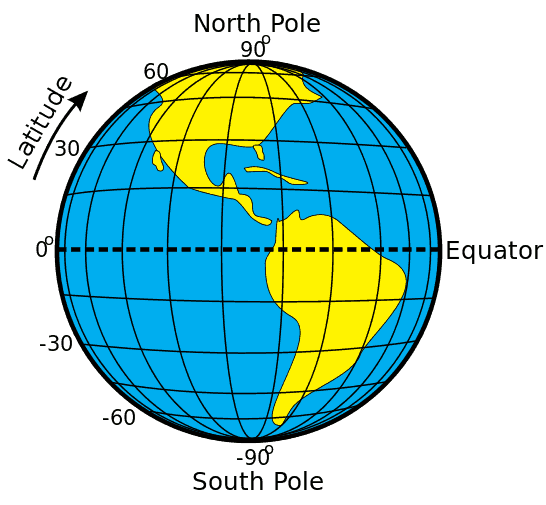 Lines of latitude start at 0 degrees at the equator and end a 90 degrees at the North and South Poles. Everything north of the equator is known as the Northern Hemisphere and everything south of the equator is known as the Southern Hemisphere. Lines of latitude are called parallels and in total there are 180 degrees of latitude. The distance between each degree of latitude is about 69 miles (110 kilometers). 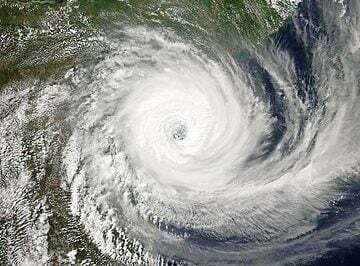 The five major parallels of latitudes from north to south are called: Arctic Circle, Tropic of Cancer, Equator, Tropic of Capricorn, and the Antarctic Circle. On a maps where the orientation of the map is either due north or due south, latitude appears as horizontal lines. Longitude lines run north-south and mark the position east-west of a point. Lines of longitude are known as meridians. These lines run from pole to pole, crossing the equator at right angles. 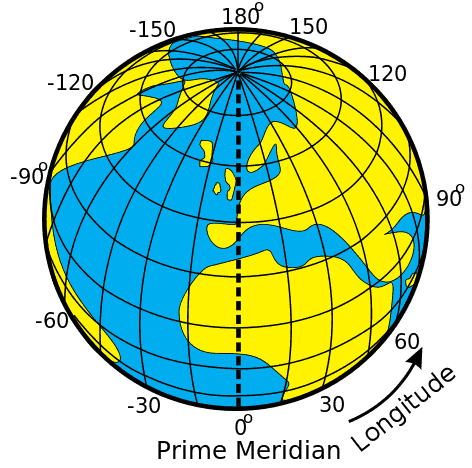 There are 360 degrees of latitude and the latitude line of 0 degrees is known as the Prime Meridian and it divides the world into the Eastern Hemisphere and the Western Hemisphere (-180 degrees degrees of longitude west and 180 degrees of longitude east). The distance between longitudes narrows the further away from the equator. The distance between longitudes at the equator is the same as latitude, roughly 69 miles. At 45 degrees north or south, the distance between is about 49 miles (79 km). The distance between longitudes reaches zero at the poles as the lines of meridian converge at that point. To provide a geographic location using latitude and longitude, a pair of numbers known as coordinates are used. Coordinates are composed of degrees, minutes, and seconds (DMS). When providing coordinates, Latitude is always written first. To provide the location of the United States Capitol building using latitude and longitude would be: 38° 53′ 35″ N, 77° 00′ 32″ W. Decimal Degrees, which converts the minutes and seconds portion of the coordinates, is another way to write coordinates. In stead of noting the cardinal directions (N,S,W, or W) in decimal degrees, points that are west of the Prime Meridian and south of equator are preceded by a negative sign. Therefore, the United States Capitol’s coordinates in decimal degrees are 38.889722°, -77.008889°. Many mapping programs such as Google Maps use DD. The equator divides the earth into the Northern Hemisphere and the Southern Hemisphere is marks the location of 0 degrees latitude. The equator marks the locations on earth that are equidistance from the North and South Poles. The equator crosses 78.7% water and 21.3% land and is about 24,901 miles (40,075 km) long. The Tropic of Cancer marks the location where the sun reaches the zenith at this latitude. The exact latitude is not a fixed point and the latest measurement for 2014 is 23° 26′ 14.675″ (23° 26′ 16″). The summer solstice, which occurs on either June 20 or 21 of each year, marks the day on which the sun shines vertically over this parallel. Map with the red line marking the Tropic of Cancer. Moving every year, the Tropic of Capricorn is the parallel line of latitude that is currently located at 23° 26′ 14.440″. The winter solstice, which occurs on either December 21 or 22 of each year, marks the day on which the sun shines vertically over this line. 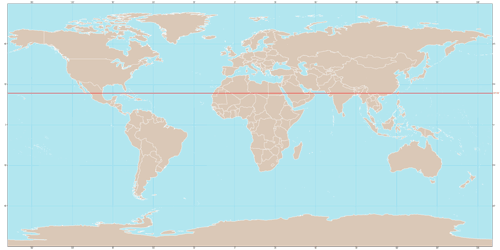 On this map, the Tropic of Capricorn is marked with a red line. The Arctic and Antarctic Circles are the parallels of latitude that are roughly 66.5 degrees (66° 33′ 44″ (or 66.5622°). The region above the Arctic Circle, which includes the North Pole, is known as the Arctic. The region south of the Antarctic Circle, which includes the South Pole, is known as the Antarctic. Map of the world with red lines showing the location of the Arctic and Antarctic circles. The line of longitude where the degree is zero is known as the Prime Meridian. Passing through the Royal Observatory, Greenwich, England, it is also known as the Greenwich Meridian and divides the earth into two equal halves known as the Eastern Hemisphere and the Western Hemisphere. The black line on this map shows the International Date Line.